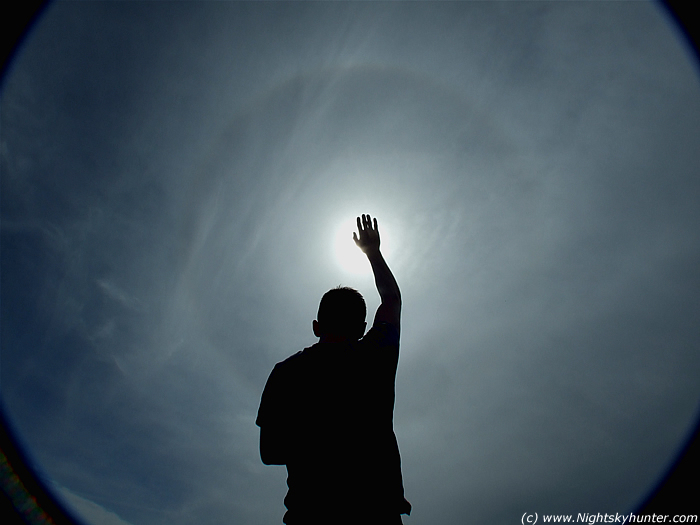 This is the 2nd image taken from Drumlamph forest, Maghera on April 26th 2008 of the nice 22 degree sun halo. My friend Ryan Mc Donald was with me at the time. Standing in front of the camera with outstretched hand, he was able to block the Sun for this shot. I was using the super wide angle 58mm lens hence the corner shadows. There is a slight area of intensity on the northern section of the halo indicating a weak upper tangent arc forming. Settings were ISO100, F/6.3 at 2000/sec.